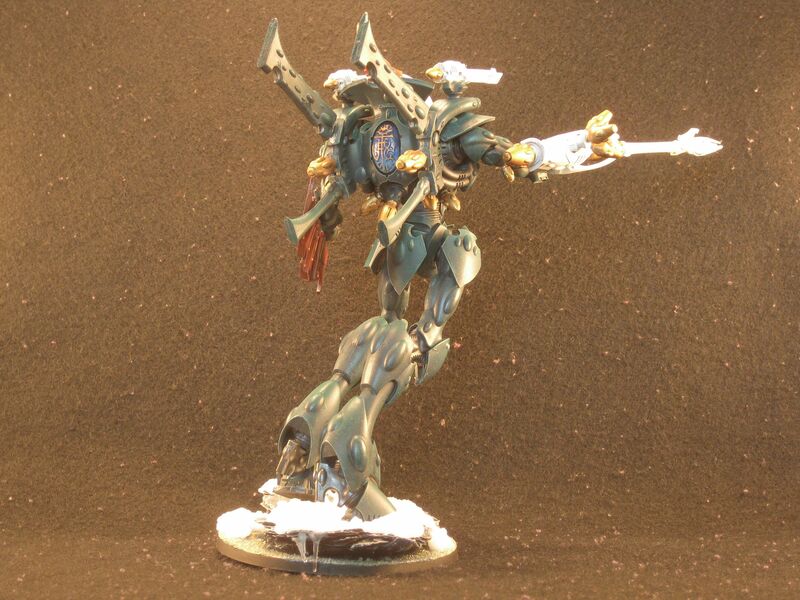 I was commissioned to assemble and paint an Eldar Wraith Knight for a Dark Eldar army. 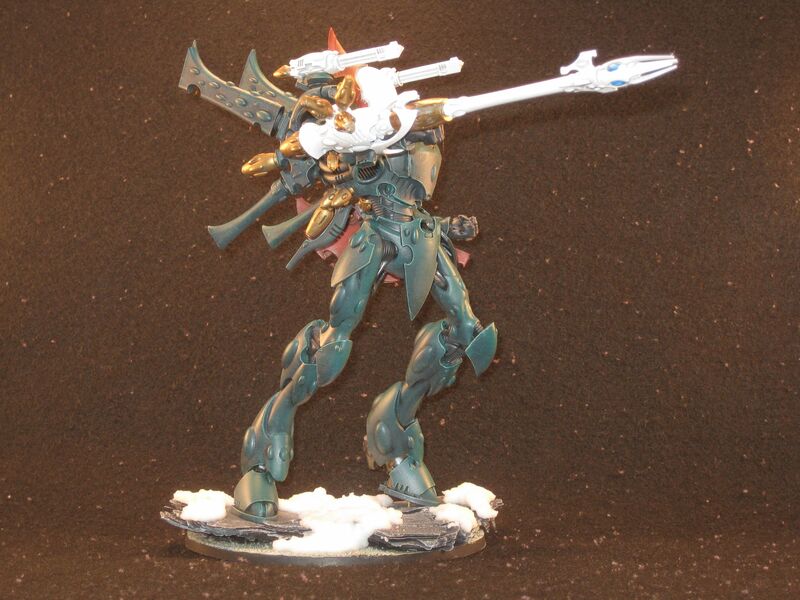 The model was purchased from yoymart, which I wouldn’t really recommend. Prepping this guy to paint took almost a week and a half. Construction proved to be a challenge too since the model was a resin re-cast, and the resin used was brittle. Most it was put together using 5 Minute Epoxy Resin. Painting was another challenge. 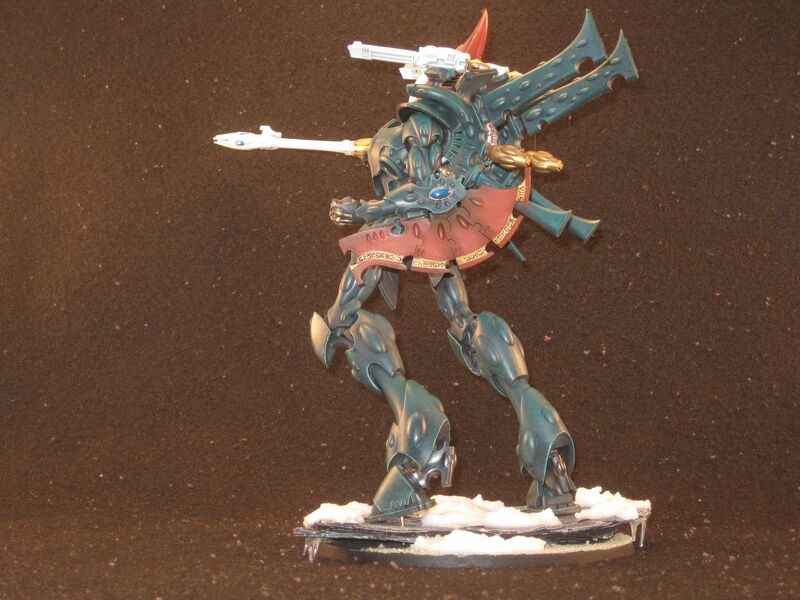 Since I can’t really find color matches for the Dark Eldar colors, I had to use the GW colors. Those don’t really like going through an airbrush. I basically had to take apart and deep clean my airbrush with each color I used. 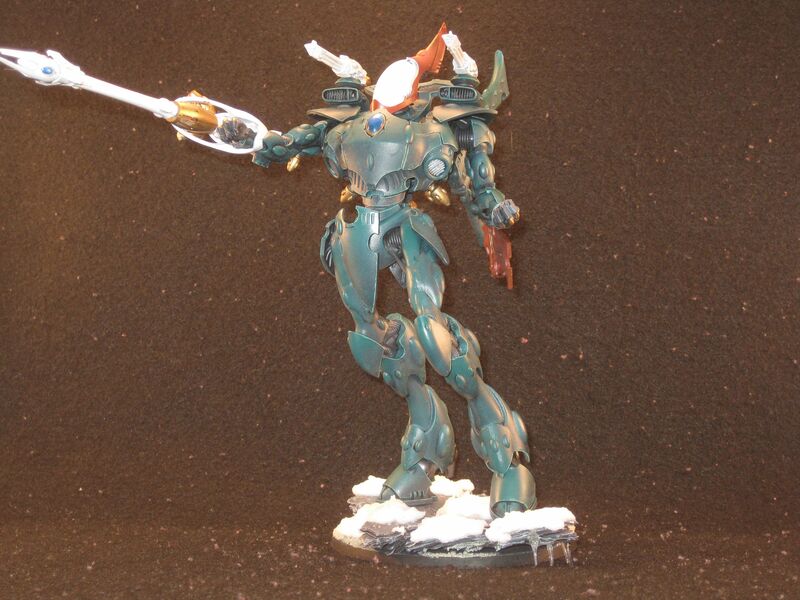 The shield, head, and weapons were thankfully done with airbrush paints, so that was a relieve when I got to them. The things that I’m particularly happy with and that I’ve gotten the most compliments are the shield, jewels, and base. The jewels were done using various colors of blue mixed with glaze medium. Once they were done I went over the jewel with Tamiya’s clear blue, but I also put a gloss coat on it to make it shimmer a bit more. The base was easy to make, and the first thing I had done. I used a piece of pine bark for the rock. The snow is made by mixing white glue with some Woodland Scenics Soft Flake Snow, and the ice cycles are clear plastic rods that I melted and pulled apart over a candle. Those where the tricky part because you know fire is hot. This is also the first time I’m using my light box. It’s a DIY light box, so there are thousands of tutorials out there that shows you how to build one. The picture didn’t turn out as well as thought it would. I personally think the model looks better in person than in this picture. The commissioner would probably agree since him and his girlfriend sat for a few minutes just turning it around and looking at it. I think I might need to play with the lighting or the back drop to produce the pictures I want.